Dec 15th. 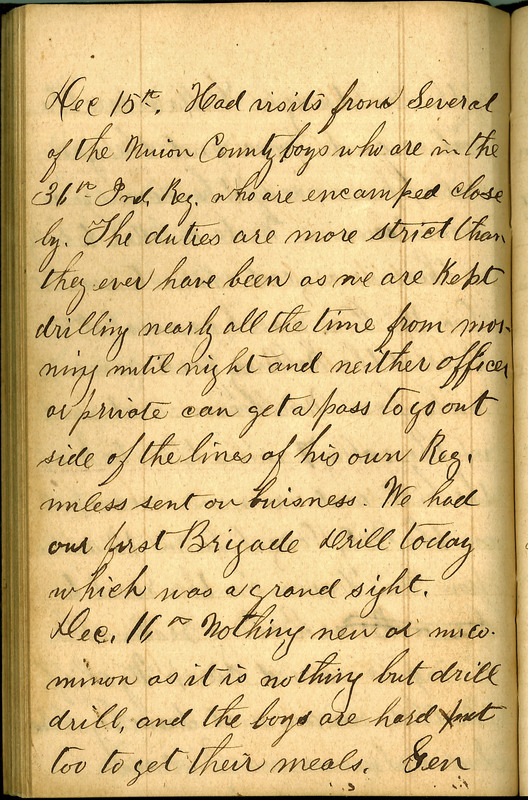 Had visits from Several of the Union County boys who are in the 36th Ind Reg who are encamped close by. The duties are more strict than they ever have been as we are Kept drilling nearly all the time from morning until night and neither officer or private can get a pass to go outside of the lines of his own Reg. unless sent on business. We had our first Brigade Drill today which was a grand sight. Dec 16th Nothing new or uncommon as it is nothing but drill drill, and the boys are hard put too to get their meals. Gen.